Attention, Pokefans: This is what your new Pokemon Black & White starters will look like - if you were in a room with them and turned off all the lights, anyway. Right on the heels of the announcement that Pokemon HeartGold & SoulSilver have sold a combined 8.4 million copies comes the reveal of the three new starting 'mons in Pokemon Black & White ... sort of. 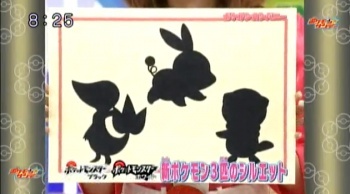 The image you see here is the silhouettes of the three Black & White Version starters. Though one can assume that - as with every other game in the series - they'll be your standard water/fire/grass-type trio, we don't know which is which. Nor do we know their names, or anything about them other than what they would look like in a very, very dark room if the only light source was behind them, or something like that. As with the last major Black & White reveal, this reveal came from the Japanese TV program Pokemon Sunday (at ~6:20), where it was presented by a cute girl and people dressed like Slowpoke and Chimchar. Oh, Japan. Personally, I don't think the one on the bottom left is the Fire-type, since it'd look a bit too much like Charmander - my guess is it'll be the Grass-type starter, what with the leaf-like object on the tail. 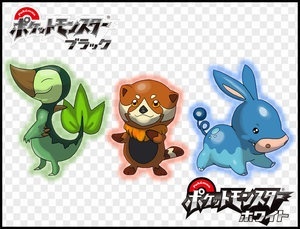 The presence of a beaver-like tail on the figure on the bottom right might suggest that it'll be the Water-type starter, but wouldn't that be too much like Bidoof/Bibarel? So by process of elimination, that means that (as far as I'm guessing), the bottom-left is the Grass starter, some sort of weird lizard thing. The top-middle silhouette is the Water starter, which looks like a cross between a piglet and a rabbit. And the bottom-right is the Fire-type starter, which might well be some sort of rodent - or a woodland creature in general. Like ... a Fire raccoon/tanuki-looking critter. But those are just my guesses, and I could be wrong. I guess we'll find out sooner or later. Update #2: Yes, the images below are officially a hoax. I'm going to repeat, just in case some people don't get it: The ones below are not the official Pokemon Black & White starters. They're still an interesting fan take on what they could look like, though, so ... we'll leave the image up for now. We won't know what they'll look like for real until Nintendo chooses to unveil them, of course.